It’s spectacular, it’s thrilling, and it’s free! Lyric Opera kicks off the 60th Anniversary Season with a fun, outdoor, family-friendly event – and you’re invited! Bring your friends and your picnic basket and relax under the stars as many of Lyric Opera’s most acclaimed voices provide you with a sampling of scenes from your most beloved operas. With the renowned Lyric Opera Orchestra and Chorus performing an array of showpieces, Sir Andrew Davis conducts this annual iconic evening featuring stars from the 2014-15 Diamond Anniversary Season. Plus, enjoy a pre-concert performance from 6:45pm – 7:10pm given by members of the United States Air Force Band of Mid-America. Don’t miss a single word of this year’s concert! 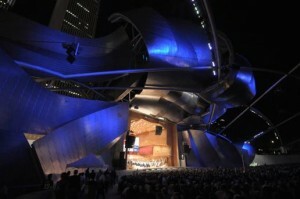 The Lyric Opera Broadcast airs this event live on 98.7WFMT and WFMT.com beginning at 7:15pm. Stars of Lyric Opera at Millennium Park is generously made possible by Lead Sponsor closerlook, inc. Cosponsors: Anonymous Donors (2), AT&T, Christine and Paul Branstad Family Foundation, Crain-Maling Foundation, Ernst & Young LLP, Rhoda L. and Henry S. Frank, Greg and Annie Jones/The Edgewater Funds, Lois B. Siegel, and The Music Performance Trust Fund and the Film Fund.